So I will always make a big deal out of my grandpa’s birthday. He deserves to have the mic for one day, whether he chooses to grasp it or not. And I make birthdays special the best way I know how: with food. Although my grandfather knows very few gastronomic pleasures, it is wrong to say he doesn’t take pleasure in food. He appreciates every bite — no matter how quickly he consumes it — as if it’s his last. He cannot comprehend the things I’ve eaten, many of which he would never even want to try. He likes what he knows, he knows what he likes. I smile at the way he cuts his beef in several little pieces like a child, swiping up the gravy (he must have his gravy) with a carefully halved and buttered roll. Bland, neutral, familiar flavors. Those suit him best. I’ve tried pushing but have learned that, on his day, that’s not the way to celebrate. A pork roast, cooked above my temperature preference. A monochrome yellow cake, filled and frosted with vanilla buttercream — the only interruptions coming from the dark specks of vanilla bean that pierce the accompanying ice cream. That’s what hits the spot, so that’s what he gets. It’s funny, then, that grandpa, a veritable pie guy, favors a pie so loud, so vibrant it shouts. Like us, it shouts so he can hear. Its bold, bloody juices pop through holes to make their presence known. But cherry pie and my grandpa go way back. Treats were certainly not in the budget for his family when he was growing up; in fact, little more than some flavorless baked beans were in the budget. But somehow — whether at school, at a friend’s, or from TableTalk Box — he found that ruby studded beauty and never let her go. So for this birthday, I made him his favorite. Well, a version of his favorite. His experience with cherry pie is limited to the gloppy, cloying kind found in many an American bakeshop. It’s a classic. 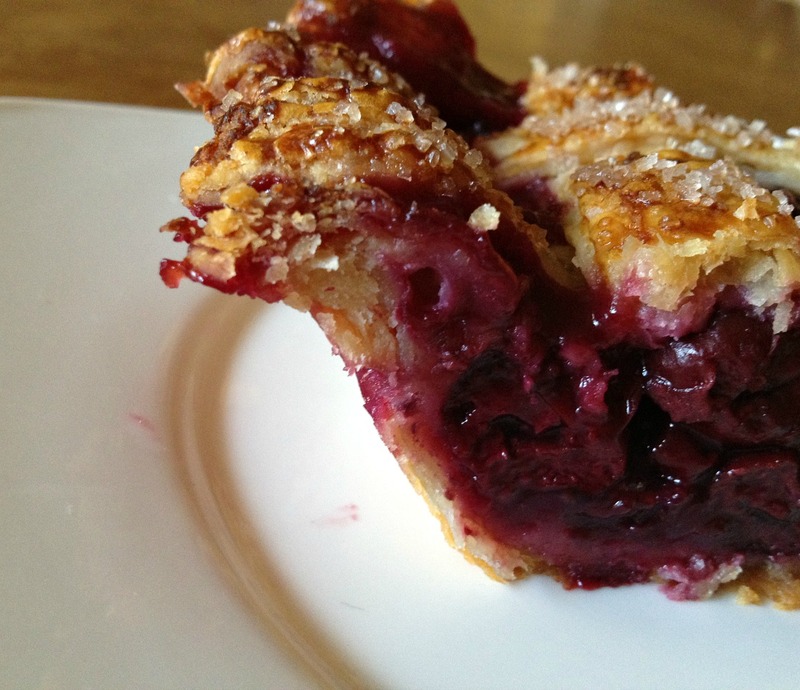 But real sour cherry pie is another thing entirely. With its lattice weave and sprinkling of sanding sugar, it’s probably the homiest dessert I make. 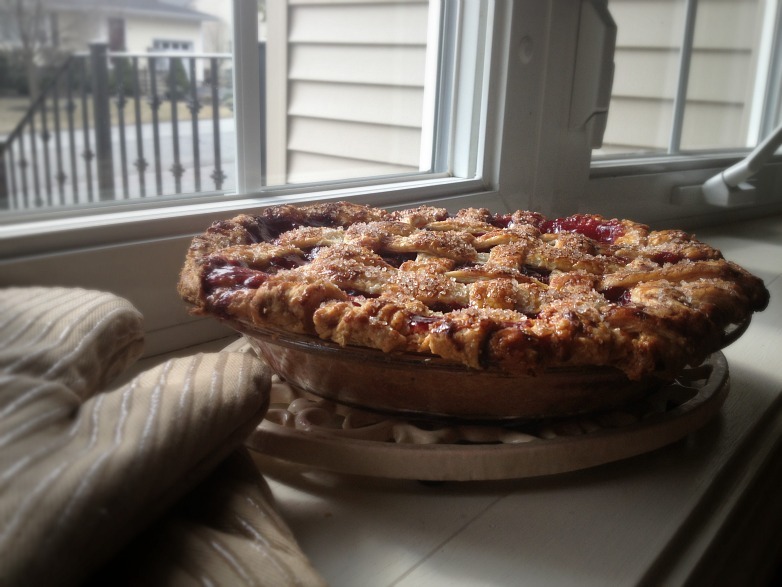 And given my own passion for pie, crafting it is a rewarding experience for me as well. Every ingredient in this pie is personal. The sour cherries were handpicked by my father in upstate NY last summer, and I thought in advance and froze them in preparation for the big day that would come 8 months later. (My grandfather’s birthday was in March, on St. Patrick’s Day. I waited to post this until you all could get your hands on sour cherries*.) I developed a new tender-flaky crust recipe for this pie in the weeks preceding the big day. I spent that morning using a firm but careful hand to ensure pie perfection. And I sealed it with the humble crosshatching of a fork -– this gal don’t need no fancy crimp. 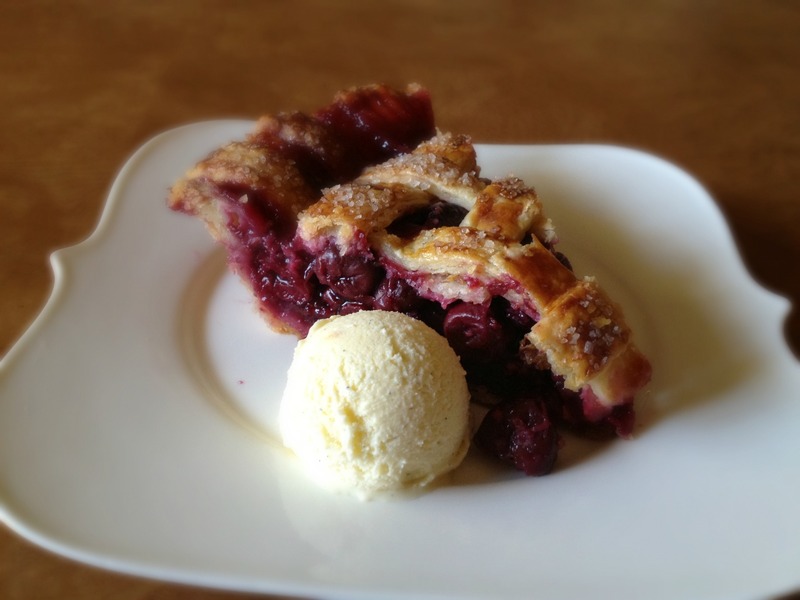 The pie is tangy and bright; I didn’t want to cover up the tartness of the cherries with an excessive amount of sugar. They have nothing to hide. The filling isn’t gelatinous; it will dribble and drabble a bit when the pie is cut, but it holds its shape plenty. It’s great at room temperature, but it’s even better heated gently and served with vanilla ice cream or a big dollop of whipped cream. It benefits from the creamy richness. The crust is buttery and flaky, but it yields nicely with the slice of a fork thanks to a few tricks. I bake it to a nice dark golden, farther than is traditional for most home bakers in the U.S. This, however, produces the most flavorful pastry with the best texture. It allows all of the water in the butter to convert to steam and lift the layers with it, even those layers in direct contact with the juicy filling. I actually rolled the crust quite thin; it gets its height from those puffed up layers that shatter in your mouth. Because my mother and grandmother can’t handle don’t care for cherry’s charms, I had to make a quick alternative to mark the day. 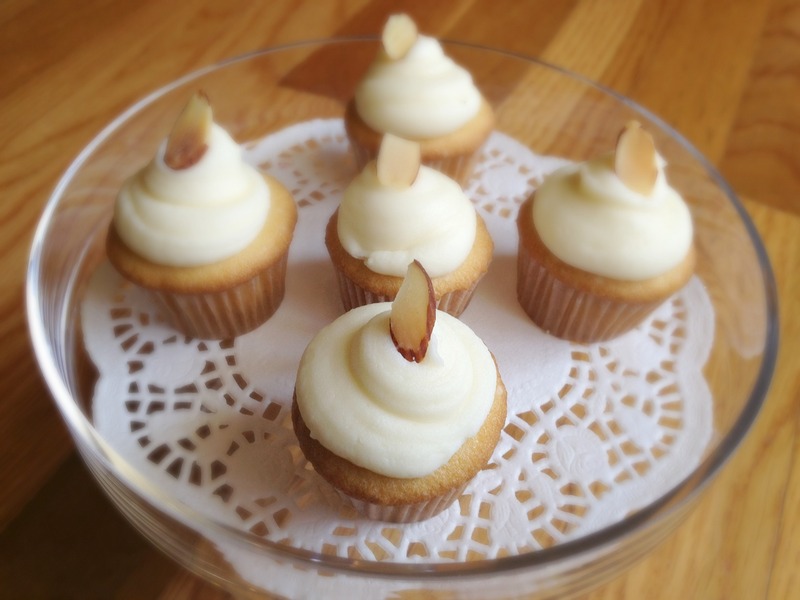 I tend not to make a lot of cupcakes -– especially mini ones. But I wanted something that couldn’t possibly outshine the star. Surprisingly, though, these simple cupcakes made from my go-to recipe and an almond cream cheese frosting (since cherries have an affinity for both almond and cream cheese), were equally applauded, so I’ve provided the recipe for the frosting below (the cupcake recipe is found in Rose’s Heavenly Cakes). They’re fine-crumbed, light, and gone in two (or one) bites. *If you find good ones, you, too, can freeze them to enjoy even on the coldest of days. They keep in the freezer for a year. 1. Place 1 dough round on a large, very lightly floured piece of parchment paper. Very lightly flour a rolling pin. Give it a a few light whacks in both directions to soften it slightly. Roll out dough from the center to the edge, smearing the butter (which should still be visible) into long sheets. Pick up the dough and turn it 1/8th after each roll to prevent sticking and to keep it as round as possible. Loosen it with a large offset spatula. Roll to 1/8th-inch thick and fit into a 9-inch pie plate, making sure it is flush with the bottom and sides. With a paring knife, trim dough to 1/2 overhang. 3. Freeze for 30 minutes before baking. This will help the crust hold its shape when it hits the hot oven. Lightly flour a sheet of parchment paper. Roll dough to 1/8-inch thick. Using a ruler, cut 12 ¾ -inch strips of dough with a pastry cutter or sharp knife. Transfer to the fridge while you mix the filling. In a large bowl, whisk together the sugar, cornstarch, lemon zest, and salt. Add the cherries, vanilla, and Kirsch, and toss to cover thoroughly. Empty into the bottom pie shell, mounding slightly toward the center. Dot with cubes of butter. Evenly space six strips vertically across the pie (shorter ones toward the ends, long ones in the middle). Peel back every other strip halfway away from you. Place the longest leftover strip horizontally down the middle of the pie. Continue along towards you, by unfolding the strips you folded and folding back the opposite vertical strips. Alternate until you reach the edge. Turn the pie around and repeat the process for the other side of the pie. Trim to a 1/2-inch overhang, fold under and seal firmly with the tines of a fork. Mix together the egg yolk and cream with a fork. Brush the lattice and edges with egg wash and sprinkle lightly with sanding sugar. 1. Pulse flour, sugar, and salt in the food processor to combine. Add frozen cubes of butter and pulse until flour starts clumping together, but there are still larger chunks of butter remaining, about half the size or so of the original cubes (not coarse meal!). 2. Transfer contents of the food processor to a large bowl. Using a pastry cutter (or two knives), cut the butter further into the flour, until mixture resembles a course meal with larger pieces that remain. 3. Starting with 1/4 cup of ice water and 1 tbsp vodka, drizzle liquid over the mixture and fold in with a rubber spatula, trying to get the dough to clump and hold together. It will not form a neat ball and still will look shaggy. This should be enough. If necessary, add more liquid as needed to get the dough to roughly hold together. Refrain from going over the limits of the recipe. You might not think it will come together and that it will not roll out, but I promise it will once it hydrates in the fridge! 4. Divide dough in half and place on a large sheet of plastic wrap. Working quickly to keep things cold and not too roughly, use the plastic wrap to gather dough into a flattened round. If things are getting warm as you do this, place the dough in the freezer for a few minutes and resume. If it gets messy, take your round and place it on another sheet of plastic wrap. Wrap tightly and refrigerate until firm for 1 hour or up to a day. The dough can also be wrapped well and placed in a freezer bag to be stored in the freezer for up to 3 months. Thaw in the refrigerator overnight before using. *Yes, the vodka thing. I know. Cook’s Illustrated isn’t the only one that does it. Given that a lot more water might be needed to bring together the dough on a humid, summer day, I think preventing any extra gluten formation in fruit pies is a good thing. These are the Yellow Butter Cupcakes from Rose’s Heavenly Cakes, and they’re perfect, so I, unfortunately, cannot post the unchanged recipe here. For cake baking enthusiasts, I highly recommend Beranbaum’s books, especially The Cake Bible. They are great resources. On low speed, cream together the cream cheese, butter, and extracts until fluffy. Add the sugar and salt and mix until smooth and creamy. This is such a touching post, and that pie looks incredible. We just celebrated my Granny’s 90th birthday and I made her a cake. My mum insisted it had a black labrador on it because my granny has always had them as companions and they are her favourite thing in the world! That is really beautiful. I love when the filling bubbles up through the crust and you get a bite of the perfect tangy filling on the crust. Yum. I’m sorry to hear that, Elizabeth. I hope your memories of him have helped you through. What a beautiful pie and a beautiful post. Happy belated birthday to your grandpa. So sweet. And that’s one great looking pie. 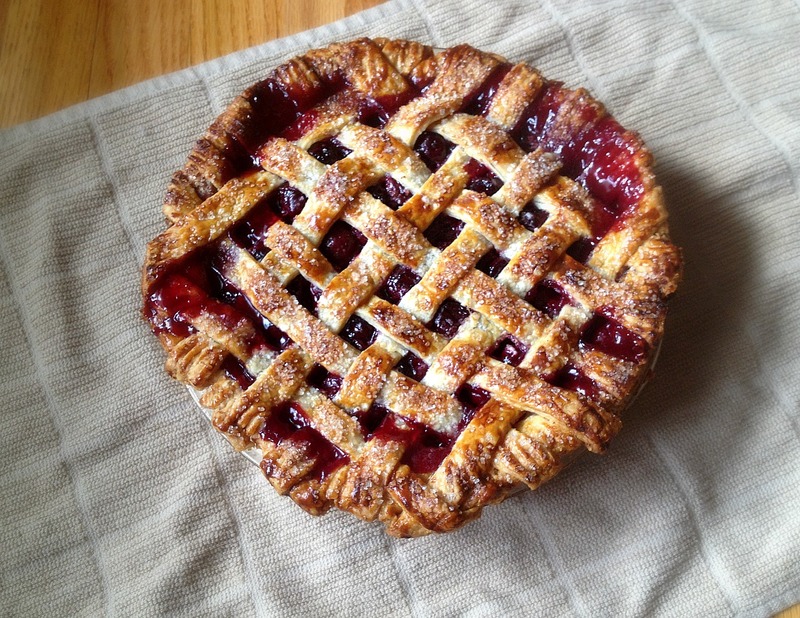 It’s funny that your Grandpa has an affinity for cherry pie, because mine does too – and on his 80th birthday a few years back this is exactly what I made him. I don’t think he’s ever been more excited about anything that has come out of my kitchen than that pie – and it felt great to serve it to him. 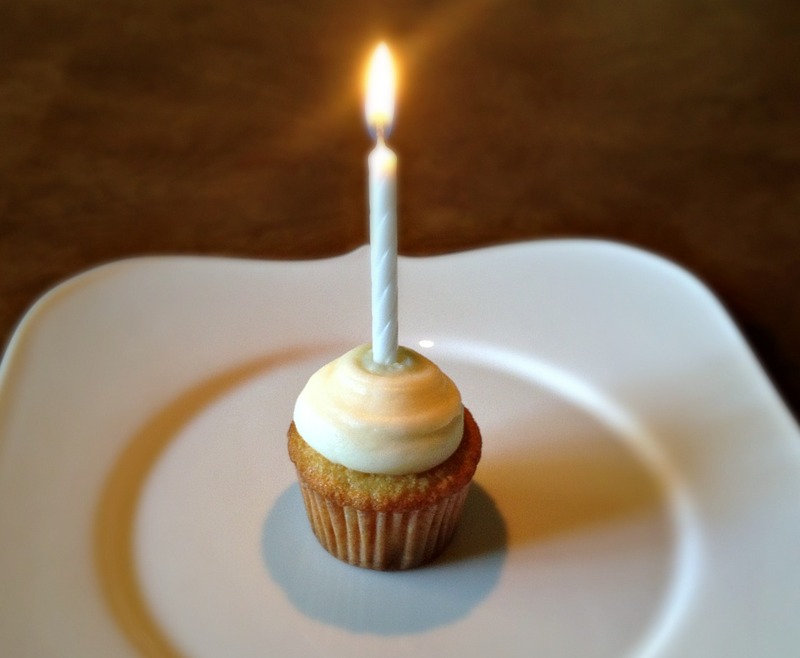 Food certainly does make special occasions a whole lot more special. This is lovely, Sacha. I love getting lost in your stories.